Earlier this week, 12 senators, led by Tom Harkin (D-IA), introduced the Complete Streets Act of 2011 (S.1056), a companion to the House bill we reported on a few weeks back. The purpose of the bills is to push states and metropolitan planning organizations to fully consider incorporating pedestrian and bicycle safety measures when roads are built or reconstructed. Like the House version, the Senate bill [PDF] would require states and MPOs to craft and adhere to complete streets policies. It goes further than the House bill, however, in that it also requires agencies to consider cyclists, pedestrians, and transit when building roads with federal funds. Both bills have been weakened from a previous incarnation, however — they no longer carry penalties for noncompliance. Complete streets are streets with safe places for everyone, whether they’re in a car, on foot, on a bicycle, or riding transit. 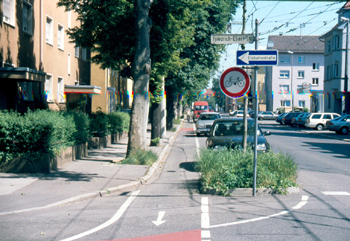 Some “street treatments” that are used to make streets more complete are sidewalks, bike lanes, special bus lanes, comfortable and accessible public transportation stops, frequent and safe crossing opportunities, median islands, accessible pedestrian signals, curb extensions, narrower travel lanes, and roundabouts, just to name a few. The power of the Complete Streets movement is that it fundamentally redefines what a street is intended to do, what goals a transportation agency is going to meet, and how the community will spend its transportation money. It breaks down the traditional separation of “highways,” “transit,” and “biking/walking,” and instead focuses on the desired outcome of a transportation system that supports safe use of the roadway for everyone, by whatever means they are traveling. The importance of the legislation is underscored by this week’s release of “Dangerous by Design,” a report by Transportation for America on pedestrian fatalities caused, many times, by streets designed without consideration for people on foot. While complete streets advocates were able to get a Republican co-sponsor, Steve LaTourette, in the House, they had no such luck in the Senate. The only non-Democrat among the 12 co-sponsors is Independent Bernie Sanders of Vermont. As a supporter of bike lanes, here’s a quesiton: Why can’t we make bike lanes in NYC more attractive? Quite frankly, when the PP anti-bike lane group complains that the bike lane is ugly. I do agree. I think it’s a fixable solution. NYC has phenomenal design practices throughout the city. Why not get a designer/planner to develop a bike lane aesthetic so our bike lanes are not only usable but visually enhancing? This might convert the anti-bikers! You would think that as summer is coming upon us legislation like this would easily get support. Particularly when it will help create jobs and help people stay healthy. covered under such a general bill. The problem is that a street isn’t really walkable if it’s too wide for the traffic it has or has excessive setbacks; suburban roads with 40 meters building to building are not pedestrian-friendly no matter how nice the sidewalks are. @Alon Levy You’re right: We don’t want federal legislation spelling out details such as how many trees we should plant per mile of sidewalk. Nevertheless, the complete streets legislation would place local walking advocates (and pro-walking transportation professionals within transportation agencies) around the country in a very strong position to negotiate high-quality walking facilities on every federal-aid transportation project.